The first complete translation of the Bible into English was the Wycliffe Bible. However, a significant number of books (including the Pentateuch, Psalms, Proverbs, and the four Gospels) were all translated into Old English in Anglo-Saxon times. Wikisource also hosts several books translated by users into Old English. 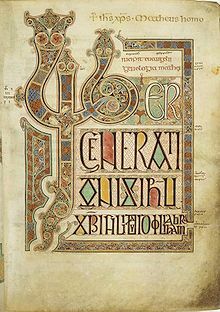 The beginning of the book of Matthew in the Lindisfarne Gospels. Fæder ūre (The Lord's Prayer), Matthew 6:9b–13. This page was last edited on 15 March 2017, at 17:06.